Presence is one of the best responsive WordPress multipurpose themes from WPzoom developer club. 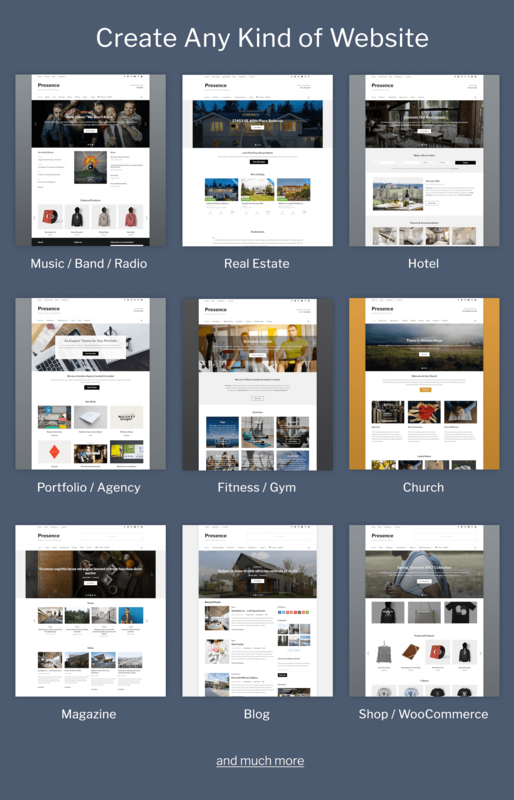 This theme would be great web design solutions those who think to use for multipurpose websites, whether you wanted to create a website for regular small scale business, personal bloggers or large scale online e-commerce solutions, Presence WordPress theme is the perfect choice to choose. It has been pre-designed with plenty of amazing web demos that including business, blog, online shop, real estate, hotels and etc. Presence WordPress Theme is fully responsive and retina ready that auto-adapts into all screen resolutions. The above each demo website will turn your website into desired company website by changing it’s contents and images. It is also coming with 2 layouts, boxed and full-width that you can use anyone from admin panel. Presence WordPress Theme is also coming with 100+ useful features to let you create quickly and kind of website you want. It comes with custom page builder, WooCommerce support to create online e-commerce website to sell/buy goods, live customizer, SEO friendly design, multiple header layouts, customize the colors, background, fonts, logo, menu and widgets, 400+ font awesome icons, social media widgets, events calendar integration, online booking plugin, team members pages and many more. Works with Popular plugins like MailChimp, Page Builder by SiteOrigin, Visual Composer, Jet Pack and etc. Drag and drop visual builder plugin by WPzoom – team members, pricing table, customer/client testimonials, Google maps integration for contact location and etc.